trainers cannot or will not dare. Taking on cases that other trainers cannot or will not dare. Who will look after the children? That is the biggest issue. For a lot of women doing a fitness class standing next to the size 8 lycra clad lady and being shown up can be very intimidating. Understandably a lot of people don’t like travelling in the cold, wet weather and its worse when it’s the dark nights of winter. These young women can only exercise at one of three times. Early morning before the kids wake up, evening when hubby is looking after them. Or late at night when the kids are in bed. I have a perfect solution! Fitness classes streamed over the internet! I stream classes from our premises into yours via the internet and that addresses all the above issues. The classes are done at 2100 (UK time). By 2100 UK time the pre-teen kids should be in bed (theoretically! ), the working day has ended. You get some"me" time, have a great workout, get a bite to eat and then you have an amazing night's sleep. You will feel energised and amazing in the morning. Just £40.07-£60.07 a month after your 10 day trial for £1 with a very generous affiliate programme. To get started please click http://www.operationmumsinmind.co.uk you'll see a page that tells you all about the programme, you can register (and get a FREE gift just for doing that), then you are diverted to a direct debit page where you pay 31 for your 10 day trial, then a health survey, then a terms and conditions page, then a form to get your individual links sent to you and finally (!) a referral form where you get your own link. Don't forget this programme pays you to refer. It takes about 10 minutes in total. We will work with you to help achieve all your fitness goals, from weight management to weight training. 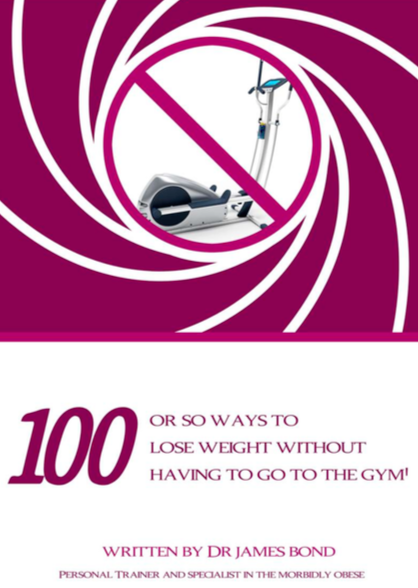 To help all the young ladies and mothers of the UK to fulfil their new years resolutions to get into shape. This is where I train a maximum of 3 people per one hour session. It costs £20 per person per session. I normally work out how many sessions you need per week. This requires an investment of £40-55 per session depending on the time of day. Now this type of training is limited to those starting their training with me. Avoid all the risks associated with gastric surgery and let me assure you that your doctors would rather you went down this route than surgery. My name is Bond, Dr. James Bond. I am a health and fitness expert and a Sheffield Star fitness columnist. I have also been featured in the Daily Mail. I work with people who want to improve their quality of life- particularly those who want to lose weight. What makes my service different is that I am the only personal fitness trainer in the North of England who is a qualified medical doctor. Therefore I can take on the general public and super high risk cases that other fitness professionals will not dare like this lady the case of Deborah Fox. ““My name is Deborah Fox I am a Tram conductor. I have had various occupations in past, have been a nurse, a care assistant, a security guard, worked at McDonalds and worked in admin. I live in Sheffield. I was 20 stone 7lb before I started my weight loss programme. I am now 15 stone 8 and half pounds. "I think the fact that James is a medical doctor turned personal trainer is a good thing it means I have more faith in what he says because he understands how the body works and he's really good at explaining how muscles work and how everything goes together and things like the drinking of water I didn't realise would affect my muscle and stuff like that. That's been really interesting to learn a lot more about how my body works which is really good. Definitely worth the money I would say definitely and yes I would recommend him to anyone brilliant, absolutely brilliant great for confidence." You'll also get a free subsription to our weekly newsletter that is packed full of the latest fitness information, tips and healthy recipes. You can unsubscribe at any time. Money: It's super affordable from £30.07 per month to £50.07 a month depending on the length of contract. We also have a super generous affiliate programme too. Childcare. Who will look after the children? That is the biggest issue. Intimidation For a lot of women doing a fitness class standing next to the size 8 lycra clad lady and being shown up can be very intimidating. We have had to bar quite a few people from my classes for making fun of the overweight. Weather- understandably a lot of people don’t like travelling in the cold, wet weather and its worse when it’s the dark nights of winter. Time. There are millions of working mums who have to get the kids ready for school and her husband ready for work. Hubby can take more work than the kids. Then she has to do the school run. Then the young lady has to do her day job. She then picks the kids up from school and then look after the family in the evening. These young women can only exercise at one of three times. Either early morning before the kids wake up. Or in the evening when hubby is looking after them. Or very late at night when the kids are in bed. However by that time most gyms are closed. Then there is the issue of safety of going out late at night. That these are the only times that young ladies can deal with those problem ladies areas- the bingo wings, the love handles, the legs, bums and tums. Fitness classes streamed over the internet! Q division has found the technology to live stream fitness classes from our studio into your living room via the internet and that addresses all the above issues. It makes far better sense to train this way. Why would you pay someone £50-55 per session for one session when you can do group personal training for £20 and for the same amount of money you can get 3 sessions in a week. On top of that I will place you with 2 people in your situation. Great friendships have developed using group personal training. You also get group accountability. There have been times in the past when for whatever reason one person can’t attend and the others have given that person a very hard time. This is much the preferred option and if you are on the one on one session programme as soon as the numbers are up and you are ready I will put you into group personal training. To get started please contact me. This requires an investment of £40-55 per session depending on the time of day. Now this type of training is limited to those starting their training with me. I am talking about those who have a lot of perceived weight to lose. We train intensively for a while and go through the 7 step training programme until I think you are able to undergo group personal training. Group personal training is much better, if anything its far more affordable. Don’t worry about the name! You go and see the family doctor who gives you some general advice and refers you to the dietician. You may well get referred to your council exercise on prescription scheme. However such schemes last at most 6 months. If you are heavily overweight its not going away in 6 months. After that six months the support goes. Nobody holds you on track, nobody holds you accountable is there to keep you focused. Things go from bad to worse and then all too often on seeing the family doctor again you are referred to the gastric surgeons who list you for surgery. Now as a former training family doctor I can tell you that with the sheer volume of information they have to learn there is no way they can learn to be fitness trained. I can also say with equal conviction that the gastric surgeons are very loathe to carry out gastric surgery unless everything else has failed. The majority of gastric surgeons are a very decent bunch and although its nice to see them on a social level I don’t want you to see them for the purpose of such radical surgery. Socially is fine- although they do have a habit of telling very bad jokes! The thing is between being discharged from the council scheme and the surgery there is nothing in between. If after one year you are not satisfied you get double your money back. However you will avoid all the risks associated with gastric surgery and let me assure you that your doctors would rather you went down this route than surgery. I have sat in many clinics as a medical student and let me assure you that no surgeon will want to operate for anything unless its absolutely necessary. To get started give me a call.